The Leghorn is a breed of chicken with origins in Tuscany, central Italy. The first birds imported to North America in 1853 were called Italians. By 1865 the breed was named named after the Italian city of Livorno, on the western edge of Tuscany, which in English is also known as Leghorn. White Leghorns are among the most popular commercial strains of layer chickens worldwide. Pure bred Leghorn varieties are less common. 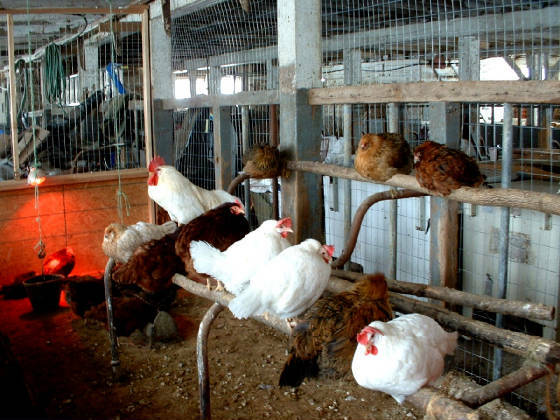 Both the American Poultry Association (APA) and the American Bantam Association (ABA) recognize a number of Leghorn varieties including white, red, black tailed red, light brown, dark brown, black, blue, buff, Columbian, buff Columbian, barred, exchequer and silver. Most have single combs but there are several color varieties that have rose combs. Leghorns are excellent layers of white eggs (around 280 per year) with a superior feed-to-egg conversion ratio. Leghorns rarely exhibit broodiness and are thus well suited for uninterrupted egg laying. The Leghorn is a light breed that matures quickly to only 3 or 4 lbs and is not considered a viable meat producer. Leghorns are active and efficient foragers. They typically avoid human contact and tend to be nervous and flighty. Due to their prolific egg-laying, they are preferred by laboratories for embryonic and avian biological research as well as being the number one breed used for large-scale commercial egg production in the United States. Leghorns are noisy birds, and somewhat smaller than other breeds. However, they are larger in size than the Bantam.